While only a trained medical professional can accurately diagnose your back problems and recommend appropriate treatment, a basic understanding of common causes of back pain and how VAX-D works to alleviate them can help you in making a more informed decision concerning your treatment options. Your spine is composed of 24 bones called vertebrae. In between each vertebrae is a fibrous disc (annulus fibrosis) filled with a jelly-like substance (nucleus pulposus), which provides flexibility and cushioning to the spine. The vertebrae protect the spinal cord, which runs through a tube at the back of the spine called the spinal canal. In the lower portion of the back, spinal nerves exit the spinal canal between the vertebrae and unite as they move down through the pelvis. Some of these spinal nerves join to become the sciatic nerves, which travel down through the buttocks, along the backs and sides of the thighs and calves, and into the feet. With such a dense network of nerves traveling throughout the back, it is easy to see how great discomfort may be caused by a slight upset in the delicate architecture of the spine. Accidents and injury may damage discs and vertebrae, putting pressure on nerves. This results in tingling, numbness, muscle weakness, or even sharp, shooting pain. Shown in the illustration below are some of the more common diagnoses for back pain. Lift With Your Legs, Not With Your Back! Many bulging and herniated discs can be attributed to lifting objects incorrectly. 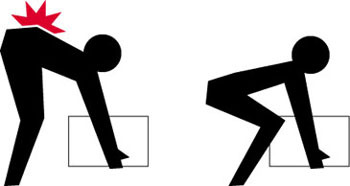 When picking up an object from the floor, bend at the knees, keeping the spine as erect as possible. Rise using the strength of your legs, as their sturdy, more simplistic architecture is designed for such exertions. Putting great amounts of pull or pressure on the spine, when bent forward or backward, can compromise its delicate alignment. Of course, there is no right way to lift an object that is simply too heavy. Listen to your body, and if you feel any discomfort while doing heavy lifting, back off and save your back! 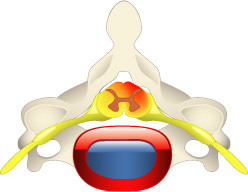 Discs are located between each vertebra and provide flexibility and shock absorption for the spine. The thick, fibrous outer disc wall, known as the annulus fibrosis, surrounds a jelly-like center, called the nucleus pulposus. Discs undergo tremendous amounts of stress, which can sometimes lead to a bulging disc, a weakening of the disc wall that causes the disc to bulge out and press painfully on surrounding nerves. A herniated disc occurs when the pressure within a disc becomes too great, tearing through the disc wall (annulus fibrosis), allowing a portion of the nucleus pulposus to protrude. The escaped nucleus purposes may then impinge painfully on nerve roots, leading also to numbness, tingling, and/or muscle weakness associated with the condition of sciatic leg pain. The illustration below gives a bird's eye view of what exactly is going on when a disc bulges or herniates. Sciatica is the sensation of pain, tingling, or numbness in the buttocks and/or legs produced by an irritation of the sciatic nerve. Multiple nerve roots extend from the spinal cord between the vertebrae and join to form the sciatic nerve, which branches as it descends into the buttocks and down each leg to the ankles and feet. The primary causes of sciatica are herniated, bulging, or degenerated discs, which induce pressure on the spinal nerve roots. Other causes include small, bony growths on the spine (bone spurs) or compression of the nerves through injury. In rare cases, the sciatic nerve may be irritated by conditions such as piriformis syndrome, tumors, or pregnancy. Stenosis is a narrowing of the spinal canal due to the encroachment of disc material or bony growths that squeeze and irritate the spinal cord and/or extending nerve roots. This can lead to pain, numbness, tingling, or weakness in the legs, feet or buttocks. The benefits that many stenosis patients derive from VAX-D may be due to VAX-D's positive repositioning and rejuvenating effect on the herniated and degenerative discs that often accompany stenosis. Spinal stenosis, which may be found in conjunction with any of the above conditions, is commonly a contributing cause for sciatic symptoms. Nerve irritation due to stenosis.